The bill limits magazines to seven bullets; increases penalties for gun crimes; gives the state more power to take away guns from mentally ill people; and bans semi-automatic rifles and handguns that have a "military-style feature," such as a bayonet lug. The ban goes into effect immediately, but people that already own such weapons are grandfathered in but must register them with the state. Following New York's lead, other governors in Democratic-led states including Connecticut, Maryland and Delaware, also are pushing for new gun laws. "You can overpower the extremists with intelligence and with reason and with common sense, and you can make this a safer state," Cuomo told reporters Tuesday. The legislation also includes a "Webster provision," named for two firefighters ambushed on Christmas Eve in Webster, New York. It would mandate a life sentence with no chance of parole for anyone who kills a first responder. 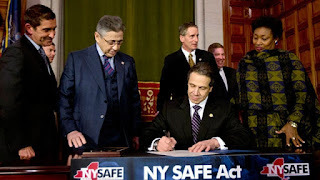 The National Rifle Association issued a statement after Cuomo's signing the bill, stating that the state rushed through the bill without committee hearings and no public input. "The NRA and our New York members remain committed to having a meaningful conversation about protecting our children and will speak frankly about the lawmakers who have failed to do so," the statement read. Cuomo, on the other hand, said passing the bill on the second day of the 2013 legislative session was meant to prevent a rush on the market of people wanting to buy assault weapons. 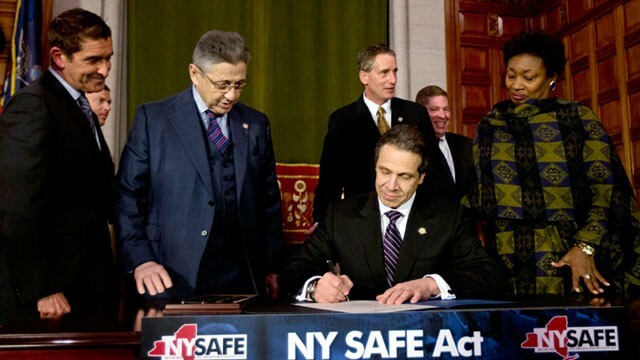 New York City Mayor Michael Bloomberg commended the governor's actions to enact gun laws that make communities safer. What do you think about this bill, the toughest on assault weapons yet? Did the state of New York go too far? Speak! sometimes u gotta push farther than necessary. the violence is extreme the laws need to answer to that.